Summary: Two misfits. One extraordinary love. Set over the course of one school year, this is the story of two star-crossed sixteen-year-olds-- smart enough to know that first love almost never lasts, but brave and desperate enough to try. 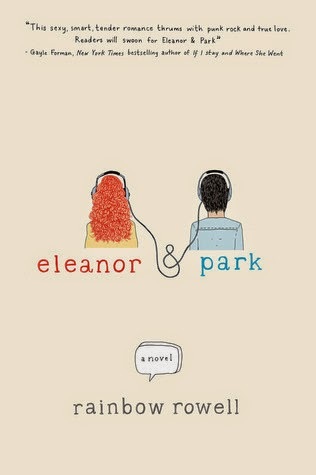 Review: So, I’m not totally sure as to why I put off writing my review for Eleanor & Park for so long. Maybe because it’s been one of the best books that I’ve read so far in 2014 and I just felt as though no matter what I said about it that it wouldn’t really encompass the way that I felt about the book, or about the characters. I’d heard a ton of hype about Rainbow Rowell and Eleanor & Park and I was wondering – who is this Rainbow Rowell and what is so special about Eleanor & Park? The characters; I very well think that they may be my favorite (though it is hard to decide) thing about Rainbow Rowell’s books, and Eleanor & Park especially. I read the synopsis and honestly wondered if this was the type of contemporary for me. But it was—it really was, you guys! The characters were so incredibly real and flawed and there were so many layers to them. I absolutely adored them. They reminded of me of actual teenagers who didn’t look or act perfect all the time; who made mistakes and were just trying to figure out where they fit in the world. I wish there were YA books like this fifteen years ago when I was trying to figure out how I fit in. My heart rose and fell so many times, and I just wanted to wrap Eleanor up into a big hug and tell her that it was okay, that everything would be okay. There was this beautiful love story with this imperfect couple and very real life issues. I wish I could go back and read Eleanor & Park for the first time again. It was one of those books that I was laughing with them, crying with them and hanging on the edge of my seat just to make sure that everything was going to turn out okay. If you’re a big contemporary reader who likes to read books with believable characters, real issues and a little bit of young love… pick up Eleanor & Park. It is worth the read!